Jordan and I had a great time exploring Guatemala and could have easily spent a month bouncing around the country. However, our late departure from Portland put us in a bit of a rush to make our sailboat reservation that would skirt us around the darien gap between Panama and Columbia, and we had friends and family coming to visit us in Panama for the holidays before we jumped to the next continent. We had a week to cover 4 countries. 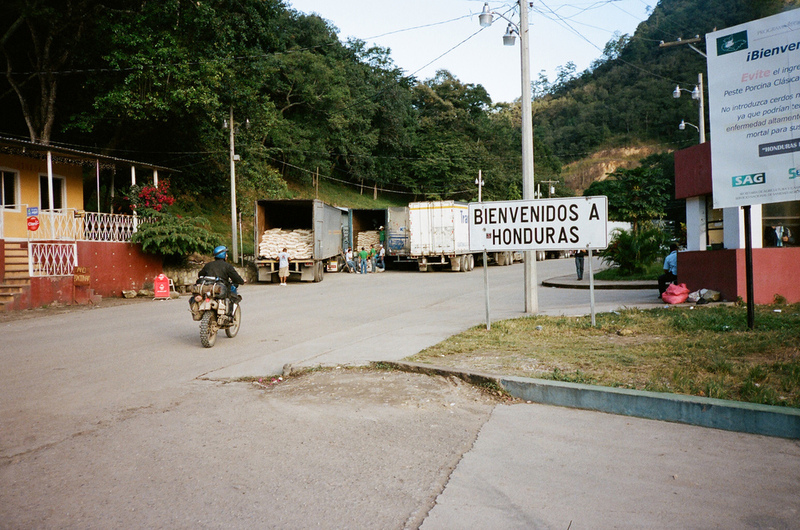 Since we were already in central Guatemala it made sense for us to skip El Salvador and traverse through the guts of Honduras crossing at the small boarder near the Copan ruins. 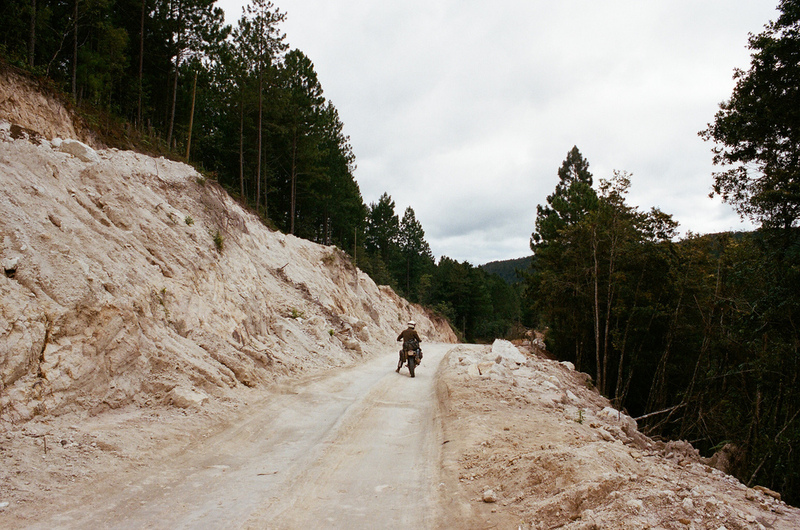 The roads in Honduras were the worst we had encountered. There are no lanes, and everyone weaves through the massive potholes in sporadic jolts. Its a total free for all and the bigger you are the more power you have. Luckily, our route turned to dirt and things mellowed out. The scenery was very reminiscent of the high cascades of Oregon, dry pine forest for as far as you could see. It was a nice comfortable feeling. As we neared the Capitol city of Tegucigalpa we could see dark clouds brewing in the distance. Knowing what lay ahead we pulled over and suited up. The moment we got our rain gear on the sky unloaded on us and we got soaked climbing through the cloud forest outside of the city. As we peaked the ridge the sky opened up for a moment and we could see the chaos of the city bellow. 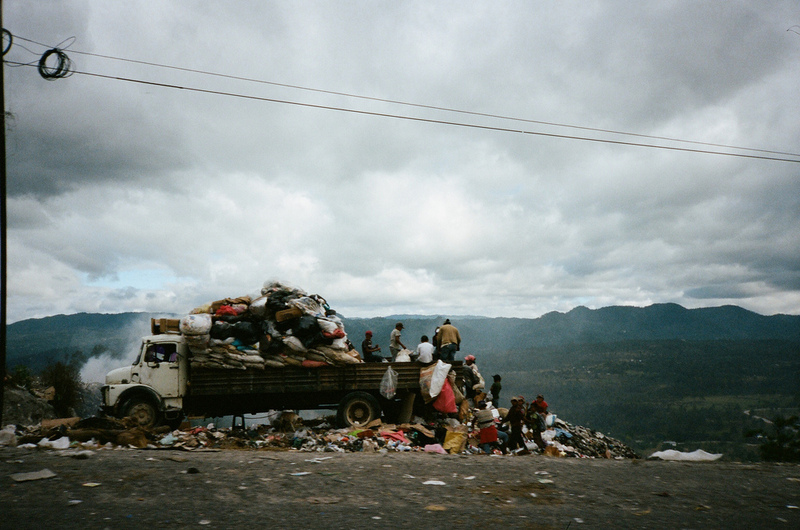 Tegucigalpa has one of the highest murder rates in the world and was a place we hoped to sneak around. We saw an exit that looked like it would detour downtown so we took it. What was a freeway quickly turned into bumper to bumper traffic, and we were now neck deep in the slums surrounded by flipped cars and piles of burning rubbish. I have never felt so uncomfortable in my life. We started splitting lanes and riding in the ditch when necessary. The whole wet experience was a total blur. As soon as we got to the outskirts of town we pulled into the first shady motel we found. It came complete with barred up windows, no lights and chinese restaurant across the street. We left early in the morning for Nicaragua. A couple hours of wading through money changers, “helpers” and photocopies had us back on the road. Nicaragua was beautiful, and my mind was lost in the surrounding volcanoes and lush fields. We sent a nice night in Leon, and stopped off at lake Nicaragua for a dip before dealing with the border crossing. The crossing into Costa Rica was dreaded and proved to be a full day affair. There is only one crossing between Nicaragua and Costa Rica so the lines and waits are long. By the time we got out of the boarder the light was slipping away quick and the hold ups were not over. Two flat tires in an hour had me sweeting like a pig in the humidity. After all the set backs we decided to push through the night towards Panama. The roads were good and we made quick time. After passing the port town of Limón, where most of our bananas get shipped out of, we found a quiet spot to set up our hammocks in the small surf town of Puerto Viejo. Crossing the border was pretty smooth into Panama. I teamed up with another motorcycle traveler from Argentina to do the dirty work while Jordan played in the parking lot with a couple kids. Once we reached Almirante we split ways for the week. I was headed to Bocas to visit with friends who were down on a surf trip and Jordan was off to Panama City to spend the holidays with his fiance. We were both stoked to be off the bikes for a bit.